Our Italia month was a wonderful part of our trip. It's been everything the end of a 'round the world trip should be... immersive yet relaxing, a step back into the West while still feeling a world away from “regular life”. Our last post recounted our travels in Rome, Amalfi and Pompeii. Since then we have traveled to less-traveled regions and a few more turistica spots, really immersing ourselves in Italian life. It's been incredibly helpful that Italians have mastered the art of living life to its fullest. And what the Italians do well, they do really well... they understand how important food & wine is in culture, memories, tradition. They value good design, and put effort into even the smallest details to make their world more beautiful. They preserve history, having arguably one of the richest cultural histories in the world. And the culture has for centuries understood the importance of convivial public spaces – creating some of the most beautiful parks in the world (we can thank the Romans for understanding that!). And they understand that life is meant to be slow, while cars are meant to be fast. All of these things have made for the most pleasurable end to our time on the road. We drove our little Fiat all over the Apennine Peninsula, from the Mediterranean to the Adriatic, from the dry farmland of the Salento peninsula to the rolling hills of Apuan Alps, connecting our two automotive legs with a long-but-fun train ride from Puglia to Florence. Now despite all of these accomplishments, the Italians have some cultural misses. They may know food, cars and clothes, but they cannot maintain or signpost a hiking trail for anything. Given Italians are known for being world-class mountaineers, Chris and I found this quite surprising. And in that vein, signage in general is just a little... thin. From roads to hotels, sometimes the signs are so tiny you wonder if they are meant to really be seen? And Italy also has the most complicated ticketing systems for the major monuments, surely designed to confuse even the most adept tourists. These little quirks are worth mentioning because one of the most interesting parts of this trip has been to observe what each culture is skilled (and not skilled) at. It's like that old joke... “In heaven, the Italians are the tailors, the French are the chefs... blah blah.” Well, I think to add to that... in heaven, the Kiwis would maintain the trails and the Americans mark the heavenly monuments. That's just something 'Murica does well! We designed our time in Italy with a purposeful pause halfway through. We wanted to slow down and experience one small town for a full week, something we have only done in a few places on our 'round the world journey. 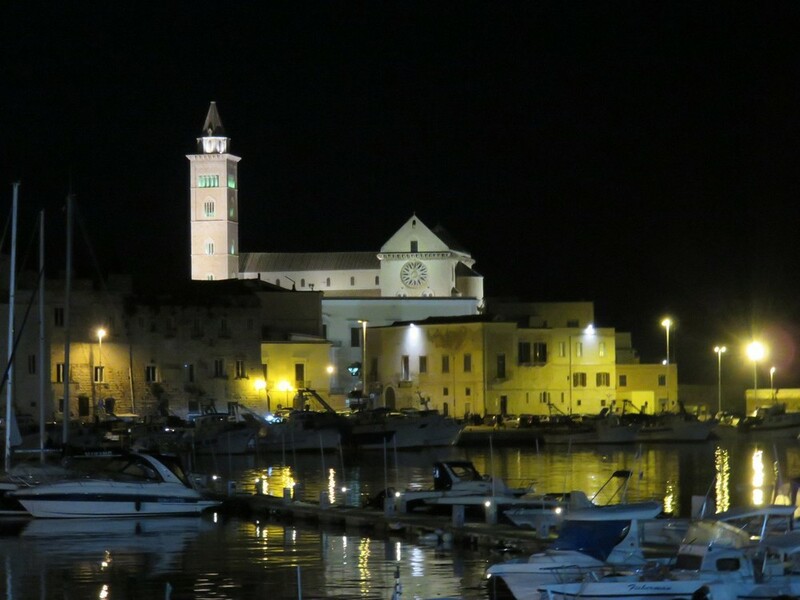 Our sojourn was in Monopoli, a small seaside town smack in the middle of Puglia. This region of Italy is just far enough off the beaten path, yet it's got great tourism. It's just not a tourist destination for foreigners. It's got beaches and vineyards, cute towns and national parks. It's where the Italians go when they want to unwind. Puglia, pronounced “Poolia” and also called Apulia by locals, is the strip of land that makes up the Salento Peninsula, or the heel of the boot. At the northern border is the Gargano Peninsula, a.k.a. the spur of the boot, and the southern border is just coastline--where the Adriatic meets the Ionian sea. Culturally, it's been heavily influenced by it's Adriatic neighbors, Greece and Croatia. In fact, many of the cute seaside towns of Puglia look exactly like what all the Greek postcards look like, including our little home base of Monopoli. Monopoli's old city with remnants of original city walls. We rented an apartment in Monopoli that is a refurbed historic building. And by historic, I mean medieval. It was literally built during medieval times, and is located smack in the middle of the old city, which has remnants of its super cool medieval city walls. Besides the historic allure, the apartment's real appeal was the location and roof deck. This little roof overlooking the sparkling cobalt Adriatic waters became our special spot where we greeted every morning over breakfast and ended each day with aperitivo. Chris mastered the Moka pot, and we enjoyed a simple italian breakfast of espresso, fresh bread or toast, and local strawberries. Sometimes a kiwi. At night, it was local Puglia wine ($2 a bottle! ), more bread, maybe olives. Sometimes chips. We switched it up. And enjoying these simple foods under the open sky will surely remain many of our favorite memories of Italy. Slow living. In between our morning and evening roof-ritual, we explored all the many treasures Puglia has to offer. We visited the seaside scenic towns of Polignano A Mare and Trani, checking out UNESCO World Heritage Cathedrals from the middle ages and watching the sea urchin fisherman sell their catch. 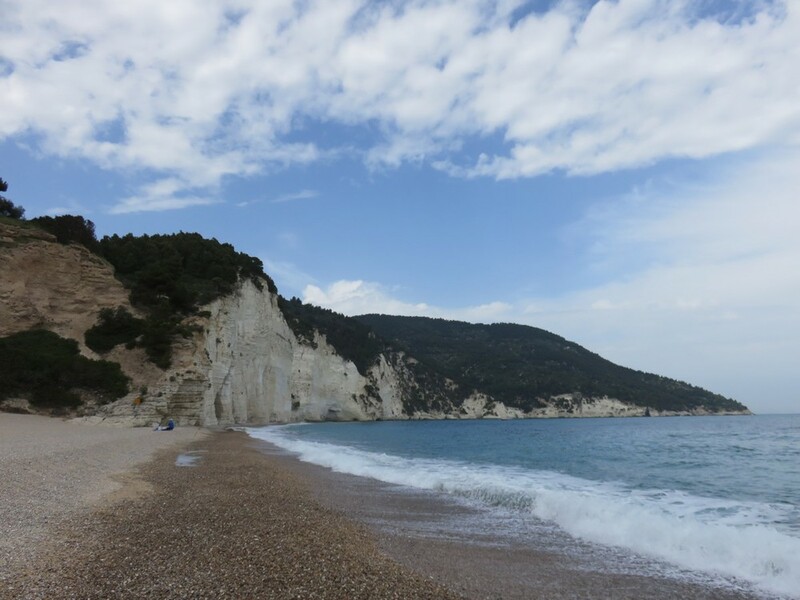 We spent an unhurried day combing the empty beaches and rugged mountains of the Gargano peninsula. We explored the famous “white town” of Ostuni, the Baroque city of Lecce, and went Trulli-hunting in the countryside. You're thinking a Trullo is a strange italian game foul? Nope. It's a weird conical dry stone hut, only found one place in the world... Puglia. The ruins of these Trulli can be found all over Puglia, and driving the roads to seek them out is iconic to the region. But for a large concentration of Trulli, the village of Alberobello is where it's at. It's a whole village of Trulli, still preserved and in tact. These icons of Apulia date back to the 14th century, but there's no agreed-upon history of their origin or purpose. Crazy! 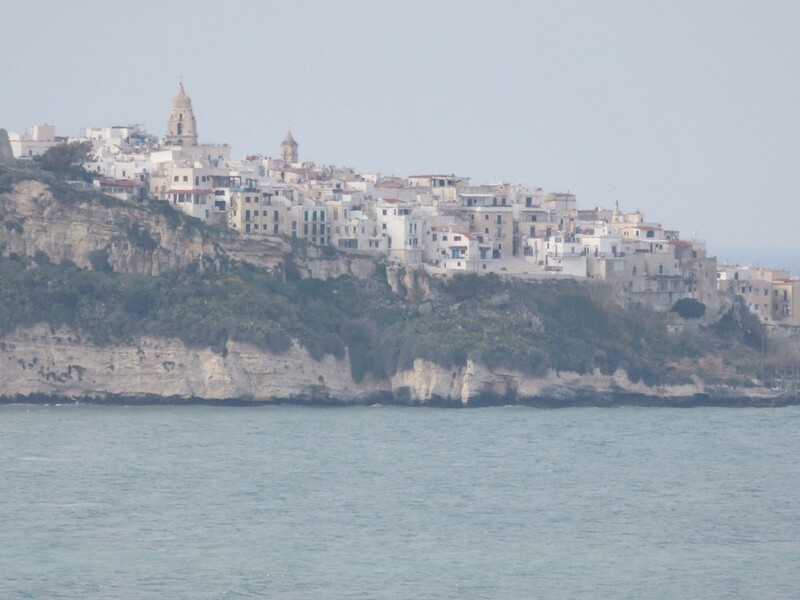 Beautiful beaches of the Gargano peninsula, aka "the shores of the spur"
Luigi and his pup, Charlie. With the sun shining on us every single day of our time in Puglia, we spent so much time outside. Every day we would walk through the old town and along the water, many days getting our exercise by running along the shore, which is dotted with cliffs and beaches. Every day I would run past an older man and his small black dog, who would run up to me and I'd pet him. His name is Luigi, and we'd eek out simple conversation in my broken Italian, with him patiently helping me, then speaking back to me wayyy too quickly. After our first conversation he greeted me every day with “Carina Gialla” which translates to yellow cutie, thanks to the bright yellow running shirt I wore every day (I only brought one, people.) By the end of our stay there, I'd grown fond of Luigi and sought him out. He sits on that same bench with his dog Charlie every day. He seemed to greet many neighborhood faces, and always was smiling and friendly, but life looked like it had been hard on him. He was wrinkled and had a quantity of teeth left in the single digits. I wondered so much about him. How old is he? Has he always lived in Monopoli? Does he have a wife at home? Is he a widower? How did he get that limp? Is he lonely? Does he have friends to play cards with? After leaving him on my outbound run, I'd always run back along the same path to say hello again. On my last day, I ran into a shop and bought us two sodas, and we opened them and Luigi said “Salute!” and the two of us sat there on the bench not saying very much as we'd exhausted all of my Italian vocabulary, so we just enjoyed the sun and little Charlie. In my imagination, I have created a scenario where I stay in Monopoli for a summer and Luigi and I become good friends. He teaches me Italian and he joins Chris and I for dinner on the roof once a week. It's a nice scenario to dream up. We capped off our 8 days in Apulia with an 8-course dinner at a masseria. A masseria is a family-run farm in the south of Italy that doubles as a hotel or restaurant. We dined with the Frantoio family at their masseria, feasting on their vegetables, local fish, homemade sausages, fresh bread, and their own olive oils. This meal was heaven on a plate and a locovore's dream come true. But the best part was Armando, the owner and patriarch. This guy was the total Italian package... charismatic, genuine, passionate, and knows how to wear a gentleman's hat. He starts each evening by giving guests a short tour of the farm, house, production facilities and gardens.... and then personally explains each course to his guests when it is presented. This may sound fancy, but it really wasn't. The cooking was simple and the dinner was unfussy. It felt like a family affair! By the end of the night, Armando was whipping through photos of his grandkids on his iPad and smiling with pride like only a Grandpa can smile. 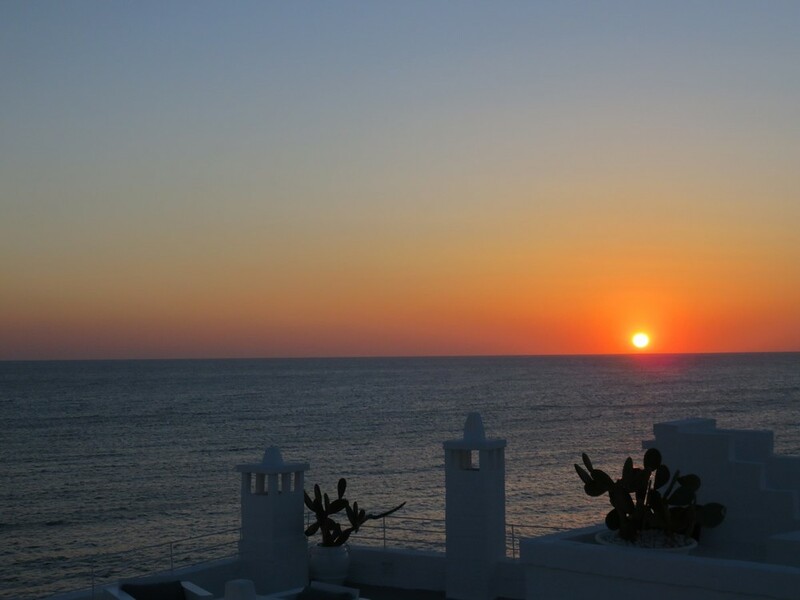 All in all, the people, culture and sunshine of Apulia won our heart. It was our favorite place in Italy, and one we'll surely return to. The last 10 days in Italy were back to our normal pace of travel. Next, we fired it up in Firenze. 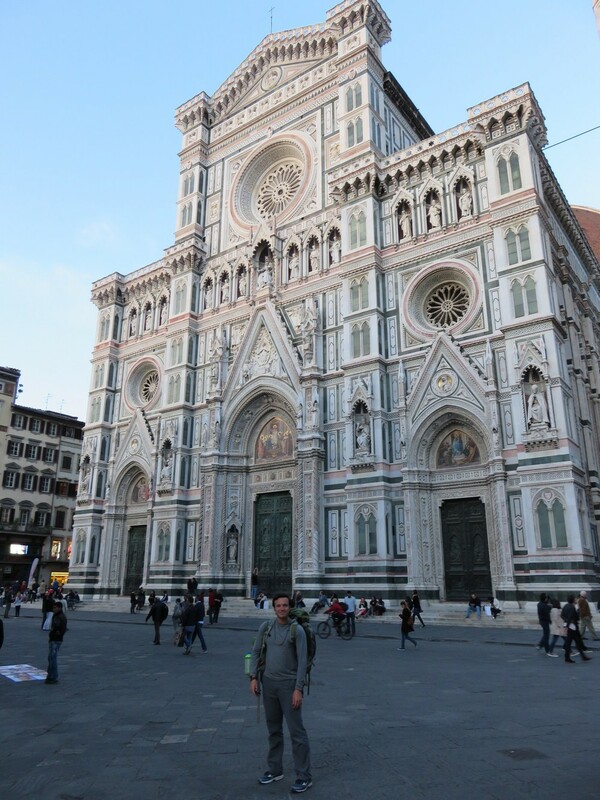 The city of Florence is so lovely, and a place I've been dying to visit ever since I took an Italian Renaissance Architecture course junior year at UDel. (Thank you, Dr. Pellechia... I still remember everything you taught us! Well, maybe like 80%..) Once again Chris and I crammed a ton of culture into a few days, traversing the city until our feet gave out, climbing to the top of the Duomo, ascending the Florentine hills to catch sunset over the city, and weaving through the galleries of the Uffizi. We crossed the Ponte Vecchio no less than 10 times, and passed by the famous palazzos and piazzas to glimpse everything we could. Seeing these architectural legends that I'd long ago poured over in a flat textbook, it felt like a whole room unlocking inside my brain, one that had been long kept shut. The food in Florence is also fantastico, and we and settled the great debate between which city has better gelato: Rome or Florence. Without a doubt, Florence. Sorry, Roma. In Toscana, we traveled to the south, the north and drove the hills in between. 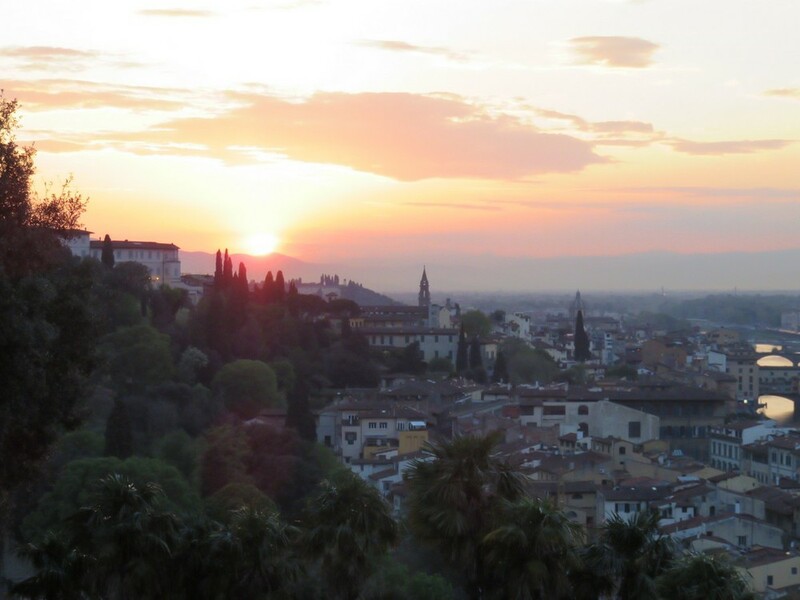 We chose Cortona and Lucca as the two towns to explore in depth, popping briefly into others like Montepulciano. And we drank a lot of Chianti and Sangiovese, and ate a lot of pasta. Unfortunately our streak of perfect-weather sunny and 70-degree days finally ran out in Tuscany, and we got some rain for two days. Boo. But the hills of Tuscany are still beautiful, even with gray skies. The landscape is so wide and rolling, with large symmetrical squares of green and brown farmland and perfectly tufted cypress trees on the horizon. The whole thing looks like an Italian scale model! I called it “toy-town,” because it barely looks real. Cars off in the distance look like wind-up matchbox cars climbing up foam hills. It's cute. Real cute. The two brightest highlights of Tuscany for us involved bikes and wines... for once not at the same time! In the Chianti region, we had an AMAZING winery lunch worth mentioning at Antinori nel Chianti. Big producers with their modern marvels of wine-making aren't our usual choice for wine tourism, as we prefer smaller operations... but this one really hits the mark. The restaurant is a glass box set inside a hilltop, overlooking all the vineyards, and the food was some of the best we've had. If you're every in Chianti, do not miss a lunch or early dinner at their restaurant. This place was an A++. The next day we worked off some of our decadence with a nice long bicycle ride. 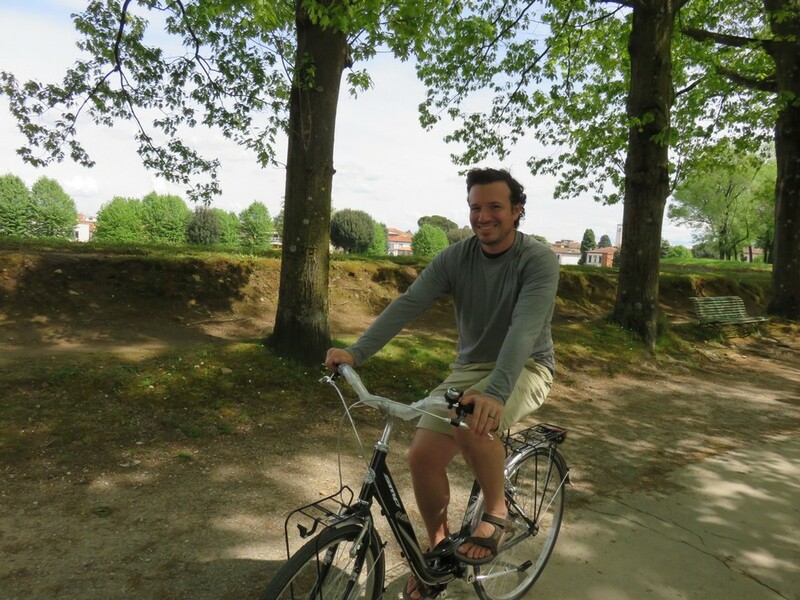 Lucca is a little town in northern Tuscany that is known for its perfectly preserved Renaissance city walls (a rarity, due to WWII bombings...) But these walls double as a park! The entire 4km circumference of the wall can be traversed atop it by foot or bicycle. We rented bikes and rode these amazing walltops, enjoying panoramic views the entire way around. From atop the walls, one can see inside the city to the beautiful bell towers and churches, and out all the way to the Apuane Alps. The wall is a lively place to be, with Luccans coming out to enjoy their town's best feature. From groups of Gramps in their tracksuits to young mothers strolling with babies to teens and school kids signing and goofing off, the whole wall just vibrates with good energy. We looped it three times, twice atop and once below, and never got tired of the sights and sounds. It was here in Lucca that we stayed our first agroturismo: Podere Di Rosa (Land of Rosa). Agroturisomo is a brilliant Italian concept (the general name for the southern versions, masserias) To foster agriculture, Italy gives certain tax breaks to small farmers who also use some of their grounds or homes to host tourists. The rates at agroturismos vary hugely, with some being super primo and others being very basic and affordable. We picked a more affordable option and were rewarded with our choice. Our hosts Paolo and Caterina were SO wonderful, welcoming and fun. We arrived and after checking in Caterina exclaimed “Welcome to za crazy familia!” Their 400 year old house is the hub, set amid fields and farm. With their teenage daughter Francesca and her friends, Paolo's four hens and Caterina's four cats, the place is a beehive of energy. Their farm produces wine and olive oil for sale, and personal crops for lemons, tomatoes, herbs, and more. And they have actual beehives, too! They make candles and honey. Their home-hotel couldn't be any cuter and their hospitality couldn't be any warmer. If you're interested, you can get their wine in the States! It's called Chiesino. It means “little church” because of the little church Paolo's mother, Rosa, kept in the corner of the property. Our last stops were Cinque Terre and Milano. Cinque Terre is the little land of 5 towns set in the cliffs of the Mediterranean, along the southern border of the Riviera. Many friends emphatically recommended this area to us, and we're so glad we listened! The pink & yellow towns nestled along the ocean are so charming, and the sea views cannot be beat. But getting here was no easy feat. The narrow twists of roads to get into Cinque Terre make the winding roads of Amalfi look easy by comparison! This white-knuckle ride was so intense, but Chris kept his cool and did an incredible job of driving them. Seriously. He was just so calm & cool, even when I shrieked several times as cars approached us swiftly around tight corners. Unknowingly, the town we chose to stay in, Vernazza, isn't accessible by car. So we had to park and hike the last kilometer on foot, with all of our bags. It was funny and fitting, reminding us to our last traveler moments that sometimes you just gotta roll with whatever the journey throws at you. Cinque Terre's Vernazza from atop the cliff hiking trail. 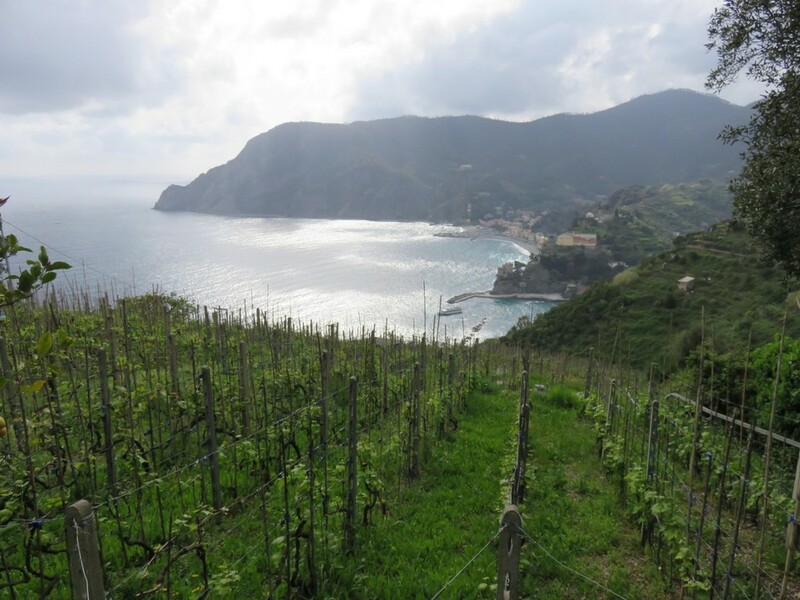 Our time in Cinque Terre was short, but we did manage to do a great hike along their well-known coastal hiking route. With stunning views and some serious climbs, we truly enjoyed this little trek. Our pasta-enhanced posteriors needed a little exercise! Sadly, much of the route was destroyed in 2011 due to awful floods. The destruction of the land is still very evident and half of the trail remains closed. This was yet another reminder during an already-solemn month of just how much us humans are not in charge when it comes to Mother Nature's force. She always gets the final word. And we said Arrivaderci to Italia in Milano, the sprawling and chic metropolis. 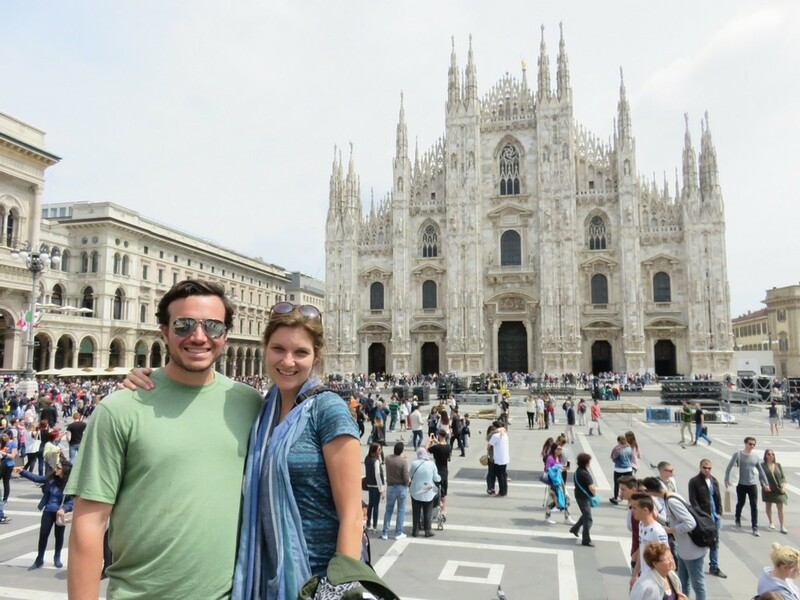 Our only big sightseeing was done at Milano's duomo, viewing the stunning cathedral from all angles. This was quite an end to all of the churches of Italy. From duomos to basilicos to chiesas to cattedrales... we explored probably 100 churches inside and out here, from the simple to the most ornate. But Milano's duomo is one of the most stunning of them all. We savored our last days in Italia, walking throughout the city to drink up our last drops of Italian sun, food, and wine. Now there's just one more stop on this bus... a quick jaunt to London to see some dear friends and meet their new bambino, before we head home to NYC this week. So we won't say goodbye... just Ciao for now! Farewell, Puglia. We will be back! The wisteria kept on blooming! On to Milano, where the flowers were blooming! A holy breakfast on our last day: The Cannoli!